A chronicle of my journey as a Fulbright Distinguished Teacher in Chile. This is not an official Department of State website, and the views and information presented are my own and do not represent the Fulbright Program or the Department of State. The Fulbright grant is completed... Now what? Although my Fulbright grant has been completed a few months back, the work doesn't stop. In fact, it looks like it's just starting. Two weeks ago, my fellow teachers and I got together for the whole day to go through two units I created while in Chile, to sort through books and materials I brought back, and to match them up the best we can with our current Spanish curriculum. We spent the day reading to each other, using strategies I learned from Chilean teachers, unpacking the books to extract grammar and culture points, and working on a timeline for implementation. When we looked at the clock, it was time to go home. And we barely scratched the surface of this project! If you are a librarian, a world language teacher, or a literacy teacher and are interested in collaborating with us on this project, kindly email dpizzuto@bernardsboe.com for more details! The Fulbright Project--Done and Done! I just submitted all the critical pieces to the Fulbright. My project is done! Before I go, however, there are many people to thank. So, here it goes! This project would not have been possible without the support of the Institute of International Education and the U.S. Department of State. I am thankful for this opportunity. Thank you to Gloria Garafulich-Grabois of Gabriela Mistral Foundation, María Paz Garafulich of Había una Vez Foundation, and Magdalena Merbilhaá of Red Cultural for helping me establish contacts in schools and build incredible connections with other educators. I would not have successfully finished this project without your support. I am grateful to the Bernards Board of Education for providing additional funds to buy literature for our students at William Annin. I missed teaching so much and can’t wait to start implementing what I learned this September! A huge thank you to my cheering team at WAMS: Christina, Catarina, Anna, Deirdre, Diane, and, of course, my incredible substitute teacher, Matt! I am thankful to my husband for believing in me as I embarked on this adventure to Chile. I love you so much, may the Force be with you. I am grateful to my parents, my mother-in-law, and my friends for checking in on me regularly and sharing both my ups and downs during this time. You guys rock!! I thank Gaby, Cynthia, Andrea M., Estela, Andrea R., Isabel B., Gabriel, Sofía, Monica, Gloria C., Andrea B., Magdalena P., Margarita W., Paloma V., and Karen for allowing me to visit your schools and classrooms and making me feel so welcome. A welcome breakfast by Villa Maria teachers. How sweet!!! Two weeks visiting Villa Maria Academy and lessons learned from its fabulous teachers. Santiago, Chile. In Chile, private schools have all the attention. Parents try to place their kids into a private school. Private schools can implement various activities as they see fit. Private schools have funds. Teachers seek to work in private schools since they have higher salaries. Private schools employ higher quality teachers. Public schools in Chile are a complete opposite. They struggle. They are poor. They serve the underserved. They lack funds. They tend to have lower quality teachers. During my time in Chile, I have visited a total of 10 schools (for now). As with anything in life, there are always things that are great, and things that need work. And then came Escuela Epu Klei in a small village of Lican Ray. both teachers and administration were extremely welcoming. Much to my surprise, it was a PUBLIC school and I was floored. In Chile, private schools have funds to invest in their students, staff, and initiatives. Parents pay tuition, and schools use these monies for learning, assessing, and other things. Private schools look, and feel PRIVATE. In public schools the situation is different: they often struggle trying to find money for supplies, materials, and so on. Escuela Epu Klei in Lican Ray was a small school that simply managed with the funds it had and was doing a great job. Creativity, professional effort, and motivation of its teachers was evident. The United States spends more money per pupil than any other country (except Luxembourg) yet there are schools that still lack in both teacher and student performance, look dirty, and lack creativity. Chile has private schools that can do anything they want with the resources they have-yet they also fall short. In fact, I have visited private schools in Chile located in wealthy areas and have not seen what I have seen in the little Escuela Epu Klei. Moreover, some private schools were a complete opposite - they collected tuition yet looked and felt PUBLIC. Escuela Epu Klei showed me that with mutual effort, strong leadership, and teacher effort and creativity, any school can be transformed into a place where teachers love to work and students love to learn. This past week I visited five rural schools located in the Araucanía and Los Lagos regions of Chile. I tagged along with Andrea and Gloria, representatives from Leyendo en Red, an collaborative initiative from Fundación Había una Vez and Fundación Luksic. Specifically, Leyendo en Red entails establishing a --very beautiful--school library, maintaining it, training the teachers, promoting reading both in and outside of the classroom, and incorporating books into daily lives of students and their parents. Additionally, Leyendo en Red also helps with “Biblioteca del Aula”- a classroom library. Each classroom in those 8 rural school has a biblioteca del aula. Escuela Rayén Lafquén, de la comuna de Villarrica. I flew down to Temuco and went all around the lakes and volcanoes. I tagged along with Andrea (representative from Fundación Había una Vez) and Gloria (representative from Fundación Luksic). Both ladies were very kind to allow me to join them, patiently answered questions I had, and even invited me to join round table discussions and ask questions of the school staff and students. Apart from Andrea and Gloria, I connected with so many teachers, administrators, students, and librarians. I felt an immense sense of camaraderie, common goals, and simply connection. I loved this initiative to promote reading. The school libraries were gorgeous. The teachers and staff motivated and wanting to do better for the benefit of their students. The students were funny and curious about books but also me and where I came from. Classroom library is a spot in the class that has books that students and a teacher collaborated on selecting together. 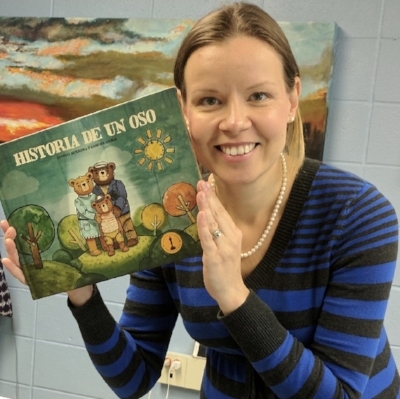 It contains both fiction and non-fiction books, oftentimes carrying books that are connected to the curriculum of that classroom: history, reading, social studies, math, etc. La Araucanía region is full of volcanoes, lakes, and forests. Los Lagos region is full of same thing. The beauty of nature, even when it was raining. Some names of the towns: Choshuenco, Lican Ray, Coñaripe, Panguipulli, Calafquén, etc. Temuco, the Araucanía, and the Ríos regions of Chile are the heartland of Mapuche nation. In mapudungun, a Mapuche language, Mapu means earth, and che means people. Mapuche nation self identify as "People of the Earth". I have heard and read a little about the Mapuche nation but never actually met any. On this trip, I had a chance to not only personally meet Mapuche people but also learn about their culture, traditions, cosmology, literature, and their struggles and aspirations. Each school library and many classrooms I visited had posters, art, and bulletin boards with Mapuche symbols, writing, and traditions. After that visit I became enamored and intrigued about the Mapuche culture. In fact, I envisioned the whole thematic unit (maybe for Honors Level Class) based entirely on the Mapuche culture. Unfortunately, that would require living in the Mapuche region for some time yet I am based in Santiago. Below are some pictures of Mapuche students and teachers. I feel grateful that I had this wonderful opportunity to visit schools in La Araucanía region since that added yet another, a completely different, perspective to my study. Thank you, Andrea and Gloria, for taking me with you and making this visit a success! And, of course, thank you to Leyendo en Red for allowing me to tag along on this journey.